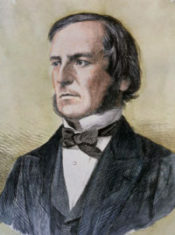 George Boole (1815 – 1864) is best known through the logic operators of AND, OR, and NOT, which some search facilities on the Internet include in order to refine queries of pages and databases. These operators are also used in the central processing units of computers as the basis of arithmetical operations. At the time, Boole was a humble schoolteacher, setting up his own school in Lincoln at nineteen, in order to support his family, his father being a shoemaker, who was much more interested in science, literature, and mathematics to attend fully to his business. Boole’s revelatory experience led him to free mathematics from the tyranny of number systems, regarding the essence of mathematics as “the study of form and structure rather than content, and that ‘pure mathematics’ is concerned with the laws of combination of ‘operators’ in their widest sense.” In 1844, he published his ideas on a general theory of operators in a paper for the Royal Society, which the fellows did not readily accept, for Boole was a precocious autodidact, working outside the constraining mainstream of mathematics at the University of Cambridge. However, he was eventually awarded the Royal Society’s first gold medal for mathematics, known as the Royal Medal. By thus gaining a reputation as one of the leading mathematicians of his day, Boole applied for and was appointed the first professor of mathematics at Queen’s College in Cork in 1849, even though he did not have a degree. It was there that he published the book that laid down the foundations of mathematical logic, titled The Laws of Thought. The first sentence tells us Boole’s intentions with this book: “The design of the following treatise is to investigate the fundamental laws of those operations of the mind by which reasoning is performed,” with the purpose of exploring “the nature and constitution of the human mind”. In other words, Boole regarded mathematical logic—as the science of mind and reason—as lying within psychology, where it logically belongs. Then, most famously, Bertrand Russell and Gottlob Frege agreed in 1902 in an exchange of letters that any psychological element must be rejected from logic, which, in their view, is only concerned with symbols. The reason for this opinion is obvious. While the human mind is constantly wrestling with the paradoxical world we live in, Russell had found paradoxes in the foundations of mathematics, which could invalidate deductive reasoning and mathematical proof if they were found in the axioms.